During the last two weeks I have talked about indexing several times – here, here, here, and here. Indexing is vital to genealogy. Because indexing is so important I am issuing a 30 day indexing challenge. Make a commitment to index during the next 30 days. A commitment that works for you. Whether you index one batch or one batch a day, it ALL helps! Even indexing one batch of records is something to be proud of – give it a try. This isn’t a contest, there is no prize – just a challenge for anyone who chooses to accept it. Choose an indexing project you want to contribute to – I am familiar with these projects found here, here, and here. And the most important detail of all – Index! While this isn’t a contest and there is no prize, I do think it’s pretty awesome to recognize good work. If you choose to join in the challenge, leave a comment on this post with a link to your blog. I will put together a page – you’ll find it right up top on my blog menu – with links to everyone who joins my challenge. If you don’t have a blog but choose to join in, I will happily list your name, just leave a comment so I know you joined the party. During the next 30 days, my goal is to index one batch for every day. But because I have a toddler and two big boys who fill my life with plenty of busy moments I am going to be flexible about how many batches I index each day. What goal works for you? 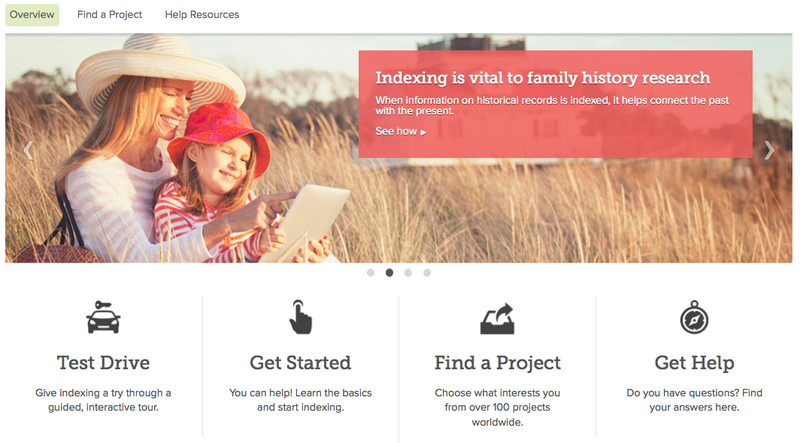 If you have never indexed there are some great helps on FamilySearch just for you. Visit familysearch.org/indexing. You will see this lovely homepage for indexers. Click on ‘Test Drive’ to try a very quick sample. Next, click on the ‘Get Started’ link for more information. There is a quick video you can watch to help you understand how to install the indexing software and start indexing. There are several other short training videos you can watch to answer any questions you have. Indexing for FamilySearch is very low pressure. You select a batch that looks good and download the batch. You have one week to complete the indexing. If it’s too hard you can return the batch for a different indexer to work on. If you run out of time and forget about it, the system takes the batch back and gives it to someone else. No pressure, no stress – get done what you can. If you get halfway through a batch and forget about it – the next indexer just picks up where you left off. Your work is still important. If you worry that you might make a mistake, don’t! FamilySearch gives the same batch you indexed to another indexer too. The computer compares the results from each indexer and when there are differences, they send the batch to volunteer arbitrators to give it a look. You don’t have to be an expert or a perfect indexer to help get records online. Just pitch in and do your best! 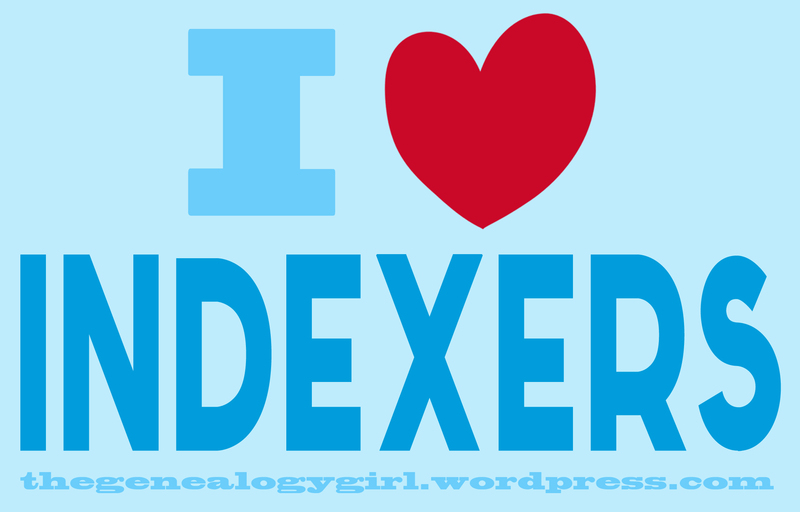 Please help make the important genealogical records of the world searchable by being an indexer! Feel like sharing my challenge with your friends? Go for it! The more the merrier. Later today I will post some buttons that you can add to your sidebar if you want to help spread the word. 28 batches so far @ FamilySearch…Signed up to index for Scotland’s Find My Past yesterday, that leaves Ancestry behind in the dust. See what you’ve started!! Hooray! I love it when I am accused of starting something good!!! OK, you got me! I’ll get back into it, but only cuz you asked nice!! The good news is that I enjoy indexing and arbitrating. The bad news…well, not BAD news but… is that I’ve got a million things going on. So I’ll stay up an hour later. I say “an hour later” because there’s no chance I’ll get up an hour earlier! Thanks for the friendly nudge. And I’m reblogging right now! Hooray! Welcome to the party!! Sounds like fun! I haven’t indexed in a while and I miss it. I also don’t want to lose what strengths I’ve gained in reading the handwriting! Fabulous! I’ll count you in. Does this mean you are taking the challenge? Unfortunately, no. I have extreme things going on at work right now. But I am hoping to get somebody else to join you! I’m sorry you are so busy! I hope things ease up soon for you. Thank you for spreading the word!